Gratitude is essentially the recognition of the unearned increments of value in one’s experience—the acknowledgment of the positive things that come our way that we did not actively work toward or ask for. The Latin root of the word gratitude is grata or gratia—a given gift—and from this same root we get our word grace, which means a gift freely given that is unearned. If gratitude is a state of being that is essential to a life well lived, why then, in modern times, do we not cultivate and express it on a daily basis? 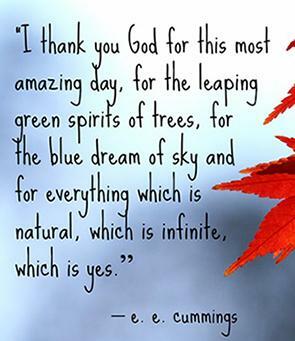 After all, giving thanks and expressing appreciation for the blessings and gifts of life is a natural human response. Perhaps the key reason we do not make gratitude a part of our daily lives is that the accelerated pace and multiple distractions of modern life have simply made it all too easy to forget gratitude’s importance. Gratitude is a feeling that spontaneously emerges from within. However, it is not simply an emotional response; it is also a choice we make. We can choose to be grateful, or we can choose to be ungrateful—to take our gifts and blessings for granted. 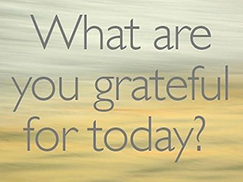 As a choice, gratitude is an attitude or disposition. As writer Alexis de Tocqueville once described it, gratitude is “a habit of the heart.” The daily practice of gratitude keeps the heart open regardless of what comes our way. Feel your God in the very center of your heart for 1 minute. Then feel your love and devotion to God in the center of your heart for 1 minute. Do this feeling of God with a feeling of joy, rejoicing, and bliss. Then for another minute, take the time to thank God that you're alive, thank God for your family and friends, and thank God for all the blessings you have received and will receive abundantly. The importance of doing it everyday is to make the practice of gratitude a part of your daily chores. This must be your first act upon waking up. In the morning, upon waking up, say a simple prayer of thankfulness to God. Be thankful that you are alive. Be thankful that you had a good night’s rest. Be thankful for your many blessings—those you received in the past, are enjoying at present, and will receive in the future. Then ask guidance for the day. Do this before eating your lunch. 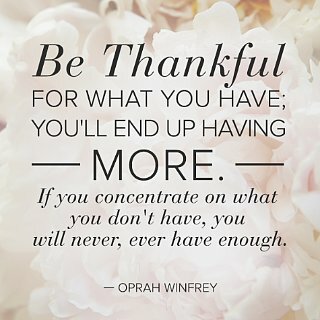 Always maintain a consciousness of thankfulness. When you eat, be thankful that you have food and drink. Also thank God for your family, friends, work, clothes, etc. Be thankful that you are privileged enough to enjoy these things. Use every opportunity throughout the day to thank God. Do this before sleeping. Be thankful for the day just ended. Especially before sleeping, don’t forget to thank God for the good events of the day and other blessings you can think of, big or small; just as you are about to sleep, give thanks to God for the day and its blessings. If you can do this a 4th time or another instance, then it will be better for you. This only takes 3 minutes to do. This improves health, protects you from danger, unnecessary accidents, and diseases. Why practice Gratitude? Over the past decade, hundreds of studies have documented the social, physical, and psychological benefits of gratitude. The research suggests these benefits are available to most anyone who practices gratitude, even in the midst of adversity, such as elderly people confronting death, women with breast cancer, and people coping with a chronic muscular disease. Here are some of the top research-based reasons for practicing gratitude. Gratitude brings us happiness: According to happiness expert Sonja Lyubomirsky, and many other scientists, practicing gratitude has proven to be one of the most reliable methods for increasing happiness and life satisfaction; it also boosts feelings of optimism, joy, pleasure, enthusiasm, and other positive emotions. On the flip side, gratitude also reduces anxiety and depression. Gratitude is good for our bodies: Studies by Robert Emmons, perhaps the world’s leading scientific expert on gratitude, and his colleague Michael McCullough suggest gratitude strengthens the immune system, lowers blood pressure, reduces symptoms of illness, and makes us less bothered by aches and pains. It also encourages us to exercise more and take better care of our health.